Just a few blocks from my house is the Dan Moller Trail, a high-traffic route that winds its way about 4 miles up to a backcountry cabin. It's a decent climb and the trail is washboarded by heavy snowmobile use (both not the most ideal conditions for a snow bike). But it is well-traveled and will probably be one of the most consistently rideable trails throughout the winter. And, like I said, it begins only a few blocks from my house. Perfect. Snow conditions today were about crappy as they get. All of the rain that fell last week is still seeping through the rotten snow, which is too warm to refreeze. So the trail is covered with grayish mush the consistency of a Slurpee, stirred up by snowmobile tracks. Riding on this stuff is sort of like a race against quicksand, where steering consists solely of trying to keep the front tire ahead of the fishtailing back tire. Where you end up - that's up to the snow. And, needless to say, my snow riding is a little rusty. I headed up the icy roads in the morning with my tires at 20 psi, and quickly deflated them to about 10 or 11 psi at the trail. (At this pressure, almost all of the tire's 2.2 inches of rubber flatten against the trail. That's nearly the width of a cross-country ski.) The ride up consisted mostly of pedaling short stretches, losing control of the bike, bailing out, and walking short stretches. I found some success in trying to line the snowmobile ski tracks, but they were harder to stick to than a wet wooden plank - and veering off the ski tracks nearly always sent me into the thigh-deep drifts just off the trail. 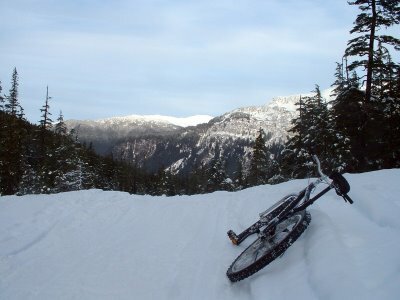 I was tentative about the ride at first, but once I realized that falling in the soft snow doesn't hurt, I found myself riding much better - losing control less often and successfully staying afloat on much longer stretches of trail. The ride down was wild. Snaux bike swerved erratically over waves of rolling bumps. But, unafraid of the inevitable bailout, I tucked in and worked on shimmying the handlebars to straighten my line without overcorrecting. Sometimes the bike just shot off the trail and I went for a swim. But, overall, I felt like I had an encouraging amount of control given the snow conditions and my summer-long hiatus from riding on any deep snow-packed trail. Some of this might be early-season overconfidence. But some might be in the performance of this new bike. I'm pretty excited about it. keep it up, but be careful! i love that feeling - realizing that it won't hurt once you fall. Reads like a good time, anyway.